The Type 97 medium tank Chi-Ha(九七式中戦車 チハ,Kyunana-shiki chu-sensha chiha?) was a medium tank used by the Imperial Japanese Army during the Second Sino-Japanese War, at Nomonhan against the Soviet Union, and the Second World War. It was the most widely-produced Japanese medium tank of WWII, with about 26mm thick armor on its turret sides, and 33mm on its gun shield, considered average protection in the 1930s. The 57mm main gun was a carry over from the 1933 Type 89 medium tank, and was designed to support the infantry, while the 170 hp diesel Mitsubishi was a capable engine for the tank in 1938. But was less effective after 1941 than most Allied tank designs. The Type 97's low silhouette, asymmetric turret, semicircular radio aerial on the turret roof, complicated hull front, and seesaw-type suspension system combined to give the tank a unique appearance that distinguished it from other contemporary Japanese tanks. The suspension was derived from the Type 95 light tank, but used six road wheels instead of the Type 95's four road wheels. First off, this is a limited boxing of the early version of the Chi-ha tank. That would be the one that was involved in pre-Pacific War conflicts against the Chinese and the Soviets, though many of these early models were used to fight against the Allies. Molded in brown plastic, all the parts come in two poly bags. There are one piece tracks so no worries about individual track links for those of you who do not like them. I'm not sure what bits are unique to this kit, but sprue R seems to be out of place in the normal sequencing of sprues so may well have all the bits that are unique to the early version of the Chi-ha. This includes the upper hull and turret mount as well as a number of other pieces. 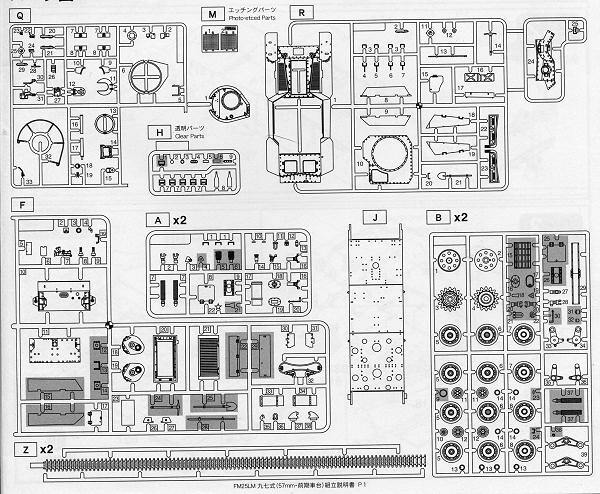 Several parts on the other sprues are not used in this version. There are no optional parts that I can see in this one. A small photo etch fret that includes a few screens is included and one can buy a more comprehensive set and an aluminum barrel if one so desires. The instructions come in two parts. One is the actual construction and consists of 21 well drawn steps. Colors are provided in both Gunze and generic names and are shown during the construction process. The other sheet has a history of the type as well as a camouflage guide and markings for four tanks. Two of these are from the early war with one in the Philippines and one during the Malay campaign in 1942. The other two are from 1945 in Manchuria, which was pretty much a backwater until the Soviets came into play in the last couple of days of the war. Included are some labels for beer or sake bottles as a couple of these are included in the clear parts. Fine Molds is as exact in their armor as they are in their aircraft models. You can count on excellent accuracy and they do have the best range of injected 1/35 Japanese military gear of anyone around. Give one a try the next time. Thanks to www.dragonmodelsusa.com for the preview kit. Get yours at your favorite retailer.